The Narrow Margin was on of TCM Top Twelve for March, and how fortuitous because it’s also been restored for presentation at the upcoming TCM Classic Film Festival. It’s cited as the definition of the B-movie, and I have to agree. It’s a thrilling, contained story held together by strong performances from a trio of actors. The movie feels claustrophobic by taking place on a train, and being the first film to utilized hand-held cameras. Whether you see this at the upcoming festival, or simply airing on TCM, The Narrow Margin is a must-see example of film noir. Detective Sergeant Walter Brown (Charles McGraw) is tasked with escorting the wife of a prominent gangster to Los Angeles where she’ll testify in court about him. Mrs. Frankie Neal (Marie Windsor) is left confined to her train compartment, fearing for her life as a group of thugs who want her silenced, permanently, come looking for her. As Walter struggles to protect her, he finds himself drawn to fellow passenger Ann Sinclair (Jacqueline White) who is traveling with her young son. 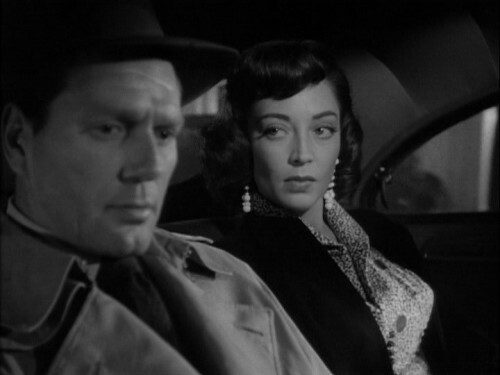 The Narrow Margin presents everything you expect upon entering the film noir universe. There’s crackling dialogue, claustrophobic settings, clearly delineated good and evil, etc. I wouldn’t consider Walter Brown an anti-hero, as created in other film noirs, because he is a good man bound to his duty. He’s so clean-cut man he finds himself falling in love and protecting a mother and her child. Through Walter, we see a bit of playing with conventions inherent in the genre. The movie opens with the introduction of Walter and his partner, Gus Forbes (Don Beddoe), as thugs. The audience is unaware of who these characters are, and the way the shadows fall on them combined with their cloak and dagger presentation, you wouldn’t be surprised to see them abduct someone at gunpoint; and yet, they turn out to be our heroes! Brown has a strong sense of duty, and feels guilt along with a loathing of Mrs. Neal due to the death of his partner when they try to leave with her. “The one time I let him go first.” Brown admires Forbes, even in death, since he died in the course of duty, but there’s a big of subtext between Brown and Forbes. Walter continuously finds ways to mention Forbes’ family, in particular the man’s wife. Did Walter have an affair with Forbes’ wife because that’s how I took it? That, or he’s just really interested in the man’s family. The movie is primarily set on a train which presents the audience with an increasing sense of tension due to the confined space. The cramped quarters, with limited exits, makes the fear real because eventually the thugs will run out of places to look and will find Mrs. Neal. Throughout, you see characters struggle to pass people, negating the ability to film conventional chase scenes. Characters duck into other compartments to hide, but end up stumbling onto sleeping people who leads to awkward situations. In one unique moment, Brown is running with the camera – hand-held – running to keep up behind him before smacking into him. It fuses the camera, and the audience by proxy, with the events happening on the train. With the realism ramped up, you also lose a soundtrack; the only music provided is ambient sounds such as Mrs. Neal’s phonograph. The sounds of chattering make up the score for the movie, or, to go along with the sense of closeness, you have normal sounds increased in volume. Mrs. Neal’s nails being filed segues into the sound of the train wheels, which is a brilliant use of transition. Let me take a minute to discuss Marie Windsor as Mrs. Frankie Neal. Windsor is commonly referred to as the “Queen of the B-Movies” and she wears that crown proudly. She’s described by Brown as a “60-cent special” and as a B-movie star, that’s àpropos. Windsor isn’t glamorous; she’s hard-boiled and capable of taking care of herself. Of course, men shooting at her doesn’t make her feel safe, but she doesn’t require Brown to hold her hand throughout the entire train ride. (Although Brown does feel content to let Mrs. Neal starve as he romances Ann.) At times, she makes the audience feel comfortable enough to make fun of Brown himself, calling him a “weeper” when he goes on about Forbes’ death. The red herring of the movie ends up not being a red herring at all, and her character redeems herself – cementing the fact she was never a fatale at all. I’d go so far as to declare Mrs. Frankie Neal a forward-thinking female character of the time period. The revelation of her character’s past life puts her in the same league as the man tasked to protect her. In fact, her place in the film is more integral, and therefore more dangerous, than anything Brown sets out to accomplish. Mrs. Neal knowingly puts her life on the line in a way Brown never sets out to achieve. The character of Ann is kind of the wet blanket out of the trio of main players. White is a good actress, but she’s milquetoast as dictated by the character. It doesn’t help that she’s saddled with the world’s most annoying child actor playing her son. He screams all his lines, and I just wished that Brown would throw him off the train! Without spoiling things, the distinction between Ann and Mrs. Neal is explored in a subtle, and therefore ingenious. way. When the twist is revealed you’re forced to reconsider your perspectives on whether a woman’s appearance dictates her personality, and what she deserves in life. Does Mrs. Neal deserve a life of hardship and crime simply because she married a gangster? And is that bound up with her hardened, brunette appearance and her brassy personality? What about Ann and her fractured family? She’s a blonde, shy, average woman. Does she deserve a better life because she looks like June Cleaver? This opens up further discussion on why the twist in The Narrow Margin is so amazing to begin with. I don’t want to spoil the twist in this because it is so well-done. I had vaguely suspected what was going on before, but a decoy character tells the audience to suspect a certain someone so early in, that your mind discounts them right away. When it’s revealed that the decoy was right, you’re hitting yourself for throwing the notion aside so quickly. It’s a well-done twist in a genre that continually tried to top itself. The ending does downplay everything and concludes with humor as the lovers walk into the sunset and the train cop disperses reporters with the aid of his girth. It’s hard to swallow the ending, particularly because the movie ends rather violently, but it’s an imperfect ending to a movie that’s near perfect. 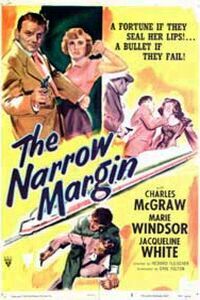 As far as this genre goes, I’ll watch a film regardless of the cast or plot but Narrow Margin kept my interest. I wanted to tell you how insanely jealous I am of your blog, layout and style. It really is gorgeous. Perhaps you can help me get mine updated as it is pretty drab and boring compared to this. I didn’t know anything about Windsor, and having seen this I might seek out more of her works. 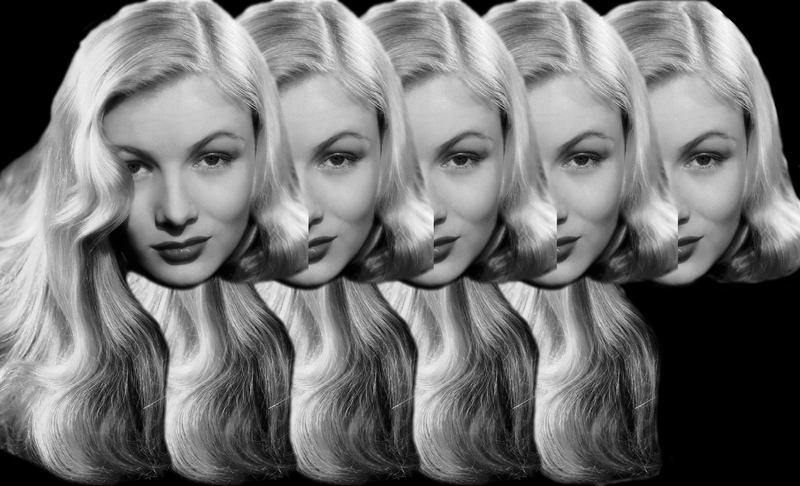 And let’s not forget Veronica Lake as a Noir Queen lol. Definitely jealous you have Windsor’s autograph! Haha, thanks for the comments on my layout. I feel I’m always changing it. If you need design help don’t hesitate to email me or send me a tweet, be happy to help!